While commerce flourished in McKinney, fortunes were made and the newly created rich families built grand homes, many of which were built on College, Tucker, Church, Benge, Virginia, and Louisiana streets- the Judge H.L. Davis house at 705 N.College Street being one of those. A number of these homes are part of the Tucker Addition, a section of McKinney that was in high demand by the city’s newly prosperous businessmen and professionals due to its proximity to the Town Square and economic center. The Davis House does not neatly fit into a particular architectural style. It was built during a period when styles were changing and were somewhat in flux. The High Victorian look was waning while the cleaner, simpler designs of the Craftsman Bungalow and the Prairie Style were just beginning to emerge. The home is essentially a blend of an early example of the Prairie Style, the American Foursquare (also known as the “Prairie Box”), and a bit of Victorian quirkiness thrown in for good measure, e.g., the Corinthian porch columns. 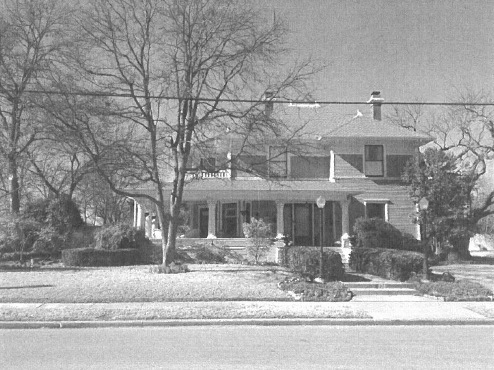 According to the 1985 Hardy-Heck-Moore survey, the Davis House and two similar houses (401 N. Lamar and 513 N. Church) are believed to have been designed by the noted Dallas architect J.E. Flanders who is better known for his design of the Craig-heard House in McKinney, numerous Texas county courthouses and churches, as well as exhibition buildings at the Texas State Fair Grounds. (15) Regardless of whom the actual architect was., the design was clearly influenced by the work of the renowned architect Louis Sullivan (1856-1924) who coined the architectural dictum “form ever follows function”. Particularly noteworthy is the use of the “Sullivanesque frieze1′—these are the stylized decorative plaster panels underneath the eaves, which resemble Irish interlace of the early Middle Age-an ornamentation Sullivan often used.” Sullivan’s designs were a major influence to the Prairie Style, an architectural style that would ultimately become popularized by and inextricably linked with his most famous student, Frank Lloyd Wright. The home was built using horizontal shiplap on the interior and diagonal shiplap on the exterior-one of a handful of homes in the McKinney Historic District to be constructed in this manner(17) Surprisingly, the home’s exterior has changed very little since it was built. The home still retains the original wraparound front porch, entry parlor, living parlor, dining room, library, butler’s pantry, kitchen, and three bedrooms and a bathroom upstairs. It is estimated that the Davis family added a garage in the 1930’s converted a back porch into two bathrooms in the 1940’s and created a storage room between the garage and kitchen by enclosing the garage breezeway in the 1950″s This storage room was later renovated in 1998 and transformed into a family room. Inside, the layout of the home is typical of Victorian-era architecture with rooms being distinct spaces unto themselves and a kitchen attached to the back of the house almost as if it were an afterthought. Although the home underwent an extensive restoration from 1997-2000, much of the home’s interior has remained the same with the original wood floors, first floor windows, wood trim and doors, and fireplace mantels. The building materials used in the interior are also typical of the era and include heart pine for the floors, Douglas fir and pine for the doors and trim, shiplap walls, and quarter sawn oak for the fireplace mantels. No other Collin County family had been in public service on the Collin County Commissioner’s Court as long as the Davis family and possibly no family has since.” With two Collin County Judges, a District Attorney, and a County Commissioner, the family served a cumulative total of 40 years in public service spanning three generations. While this is impressive enough, it excludes over 30 years teaching in McKinney’s public schools and more than 25 years serving as McKinney’s Postmaster. Indeed, the Davis family contributed greatly to their community. Judge Davis enjoyed a fair amount of commercial success as evidenced by his significant land ownership and multiple farms the family rented. At the time of his death he owned a total of 715 acres in 12 separate properties. (24) He may have been a land speculator as the Collin County Land Records are peppered with numerous buy and sell transactions by H.L. Davis. While the home is named “Judge H.L. Davis House”, it might more aptly be titled “Judges Davis House” as grandson Don Weaver Davis, who served as Collin County Judge in Precinct 1for 12 years (1960-1972),(34) also owned and lived in the Davis House from 1970 to 1975. 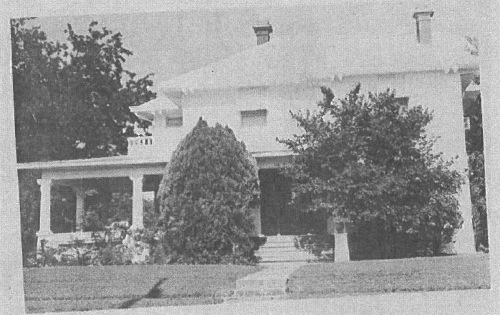 Don Weaver (son of Don 0. and Gladys Davis) and his wife Patricia purchased the home from Carrie Jean for $22,500 on July 7, 1970. (35) Don Weaver died on October 22, 1975 but his wife Patricia continued to own the home until 1978 when it was subsequently sold out of the Davis family. (36) Thus, beginning from 1887 which is the earliest documented date of a dwelling on this property, the Davis family had owned and lived in this house for an impressive 91 years spanning three generations. Sadly, the home went through a period of neglect over a number of years and experienced severe deterioration. Neighborhood residents state that the porch roof had numerous holes with parts of the porch ceiling visibly hanging. Sections of siding had fallen off and much of the lower siding that had not yet fallen off was rotting. The second story window frames had decayed to the point where holes were visible. In the interior there was a visible sag in the living parlor ceiling, so much so that the occupants had discontinued using the upstairs bathroom for fear that the claw foot tub would come through the floor and crash into the room below. This once grand residence had unfortunately become the eyesore of the neighborhood and was considered by most to be beyond saving. Fortunately for the residence and the neighborhood, a young couple (the Parnells) willing to take on the challenge of restoring this fine old home purchased and rescued the home on May 16, 1997. (37) For three hard, long years the couple labored alongside contractors to restore the beauty and dignity of this grand home. Steve Ostrander, a historic home restoration contractor of Ostrander Construction, performed the majority of the contract work. Every surface, every system, every fixture, every feature, every seam experienced a repair, enhancement, or replacement with care taken to blend with the original home as much as possible. The result was nothing short of miraculous. The house emerged as elegant as before, morphing from the ugly duckling of the neighborhood to arguably one of the finest in the historic district. The City of McKinney was impressed enough with the restoration that it awarded the home the Renovation Excellence Award in 2000-a prestigious award presented to only one renovated home each year. Unexpectedly, employment forced an out-of-state relocation for the Parnell’s. Reluctantly, they sold their home to the Seeger’s on May 25, 2000,(38) almost exactly three years from the date they themselves had purchased it. The Seeger’s major contribution has been the landscaping. Co-located among other fine, restored historic homes, Judge H. L. Davis house has since been the subject of advertisements and was one of many homes on the Heritage Guild’s 2001 Christmas Tour of Homes. This paper was researched and written by Clyde Seeger and Helen Hunt in 2002 and submitted to the Texas Historical Commission and achieved the honor of a medallion to commemorate the home as a recorded Texas Historical Landmark. The Seeger’s ultimately sold the home in 2005 to the Hampton’s, David and Jill, who have resided in the home for the past nine years with their two daughters. Their major contributions to the home have been a pool, various landscaping improvements to the entire property and a slight remodel of the kitchen in 2011 as well as numerous decorating changes to the interior. The basic footprint of the house still remains as it always has been. There have not been any major structural changes made to the house by the Hampton’s apart from basic maintenance and upkeep of the grand old girl. The house was on the 36th annual Holiday Tour of Homes in 2009 and also was on the McKinney Garden Clubs bi-annual tour of homes and gardens in 2008. 4. Hall and Hall, P33. A) and 1902 Sanborn Map. 17. According to Steve Ostrander, Historic Home Restoration Contractor. 18. Hall and Hall, p 171. 27 Obituary of 1. Lyman Davis (McKinney, Texas Weekly Democrat Gazette) October 1,1953. 32. Obituary of Carrie Jean Davis, (McKinney, Texas Courier Gazette), October 23, 1975.